I’ve decided to start posting some stories and essays that I liked, but decided weren’t right for Secrets and Lies, which is a themed collection of short fiction specifically. 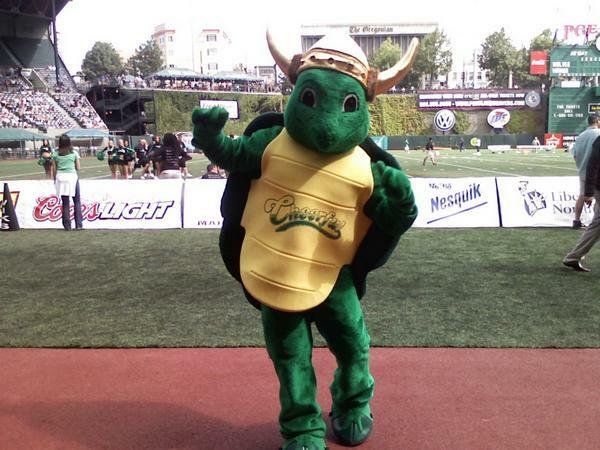 The first in the series, is a short memoir/personal essay about the day I spent working as a mascot. Emma and I walked the two blocks from my apartment to PGE Park together, and then to the bar across the street that would be paying us at noon. We were immediately taken to the back deck, and into the supply shed where I put on a large turtle costume in full view of a large group of Japanese patrons who were thoroughly enthralled. When I exited the shed, they all insisted on getting their pictures taken with me. Feel free to insert your own semi-racist stereotypical thoughts about Asian people and photographs here. This is the job I got with my fancy college degree. Then we went to the park, and walked around in front of it handing out flyers for the bar and their after-party. I gave a lot of little kids high fives. Then one of them said he hated me, because he knew I wasn’t a real turtle. So, I said I hated him right back. Then another punched me. I decided to steer clear of little kids, and instead danced to the guy playing buckets, and told the lady registering voters that I was concerned about global warming as it destroyed my natural habitat. She said turtles should vote Obama. After that, I was lead down to the field where I was supposed to clown it up. Luckily, it was a reasonably cool day—around 60—but I was still going nuts inside the suit. Mostly because there wasn’t much of an air-hole, so it was hard to get oxygen. I had to take frequent breaks. For my “act,” I mostly imitated silent movie routines, many inspired from a recent reading of Harpo Marx’s autobiography. I marched, mimed the security guards, and imitated the cheerleaders. Then I saw someone I knew in the audience, and so ran into the bleachers to accost her. She had no idea who I was, and was completely terrified, which was hi-larious. Then I had a dance off with the PSU viking, but he quit early on cause the suit was too hot for him. When he took his helmet off, I saw that he had a mohawk too. I went back and danced on my own. I did the Ninja Rap dance from Teenage Mutant Ninja Tutles 2: The Secret of the Ooze, a joke that no one but me could possibly have gotten, but I thought was hysterical. Once, when I was resting with the head off, a reporter I knew walked by. He waved hello and kept walking as if nothing was out of the ordinary, as if despite my working alongside him for two years at the campus newspaper, this was exactly what he expected of me. When the game was finally over, I went back to the bar to get rid of the suit. Polo-shirt clad douchebags in their fifties asked me if I did any other animal impressions. Later I wished I’d flipped them off as my bird impression. Then, the person who hired me found me drinking a big glass of water. She was really drunk, and started going off about how amazing I was. So much so that she might actually have been trying to starfuck me for my sad little role in today’s event. It was hard to decide which was worse; doing the job at all, or being really good at it. I went inside to get some coffee, and when I looked up at the TV, I saw that the bar was showing the Gorge Games, the TV broadcast I’d been a producer for over the summer. It wasn’t one of my segments, but it was close enough. That was the insult added to the injury. In the end, I was paid sixty bucks cash, and asked to do it again for the next home game. And since I had no other source of income, I agreed. Afterwards, I went to a play and out to eat which cost around $45, bringing my earnings for the day to $15.